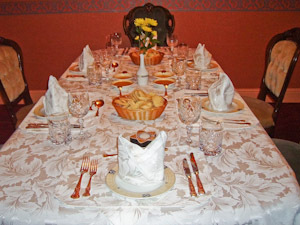 Thai Kitchen in Lakeland provides catering for dinner parties and special occasions for a minimum of 8 people. The price given below is per person, and is all inclusive of prawn crackers, rice, coffee, tea, and mints and your meal. All meals are served with Thai jasmine fragrant rice. Your meal can be either (3 starters, 4 main and 2 dessert dishes) or (3 starters and 4 main course dishes). Please select your dishes from the online booking form. I will then reply, to confirm your booking. Please note that there are vegetarian options for some of the dishes on the main menu and these are marked by '(V)' and can be indicated on the booking form along with your selection of dishes. If you do not select the vegetarian option then the dishes will be prepared as listed. Please note that some dishes may contain peanuts or garlic and may be very spicy. I can cook your meal according to your requirements. Thai beer can be supplied and the cost is £1.80 per bottle in addition to the cost of your meal. Please note whether you require either a 9 or a 7 course meal and the number of people in your party. I will then cook enough food to provide for all your guests. The prices given below are per person, and include prawn crackers, rice, coffee, tea, and mints to accompany your meal. All meals are served with Thai jasmine fragrant rice.